All types of weather can have a negative impact on infrastructure, specifically parking lots. However, it’s the variance between different types of weather that can cause the most significant damage to asphalt or concrete roads and parking lots. The relatively quick change from scorching summer days to freezing winter nights can accelerate parking lot damages. Coastal areas along the Atlantic also have their own unique concerns when it comes to the lifespan of a parking lot. There are a few ways that the Chesapeake Bay weather can impact your parking lot. 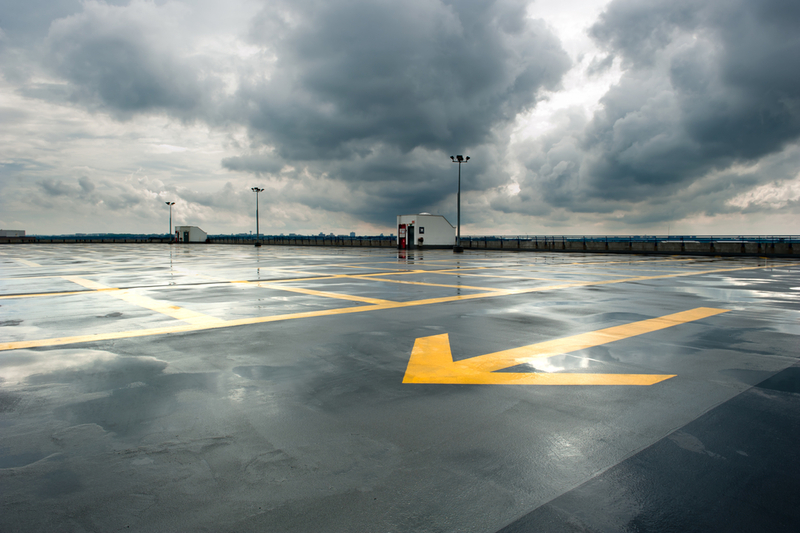 Cracking is the most common type of weather-related damage to parking lots. Cracking is especially prevalent in areas that experience both hot, dry summers and cold, wet winters. Cracks will appear in asphalt when water gets inside of the asphalt and then freezes when temperatures drop. Because water expands when it freezes smaller cracks will become larger. Similar to cracking, potholes can be created when there is contraction and expansion of water that turns to ice. This is accelerated when there are rapid changes in weather. One of the primary differences between cracks and potholes is the rate at which potholes can worsen if not repaired quickly. Parking lot markings will fade over time; it is inevitable. However, prolonged exposure to extreme sun in the hot summer months will hasten this occurrence. While asphalt isn’t impacted by saltwater, concrete is. This is because the bonds used in concrete are different than asphalt, and salt can break down the concrete bonds over time. If you have a concrete parking lot, the saltwater that constantly blows in from the ocean may cause eventual degradation. The Chesapeake weather will impact your parking lot, but NVM Paving & Concrete helps with repairs, maintenance and seal coating to help prolong its life for as long as possible. Give us a call at 703-423-0471 or send an email to [email protected] to find out more about our services.